Bago is one of the ancient city near Yangon Myanmar, just 76km away from Yangon. You can do a day trip if you have few days in Yangon. Staying in Yangon is still preferable as the hotel facilities is still better off in Yangon. There are several attractions to see in Bago but all can be done within a day. 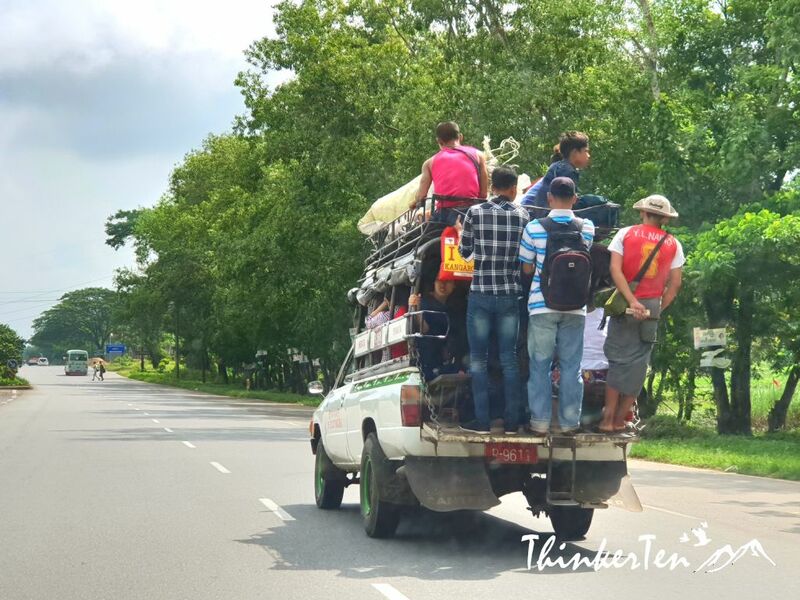 The road trip from Yangon to Bago can be very interesting, especially when we are away from Yangon city. There are few characteristic where you can see on the road trip. Check this out. 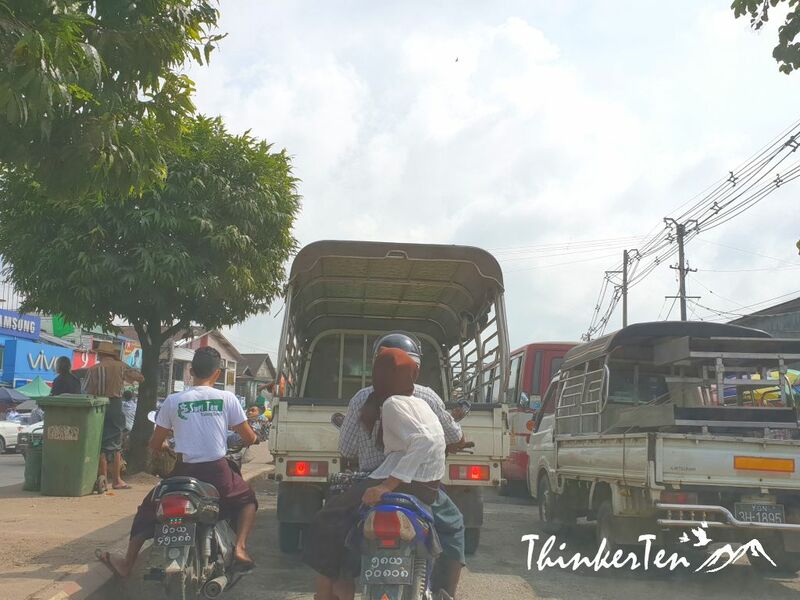 Unlike in Yangon City, motorbikes is banned due to some reasons, one of them I heard from our driver was a motorbike rider made a threatening gesture to a military general and he was angry so motorbikes were banned. In a way it is nice as you don’t hear loud motorbikes noises. But I can tell you the traffic can be very jam as most people can only drive. 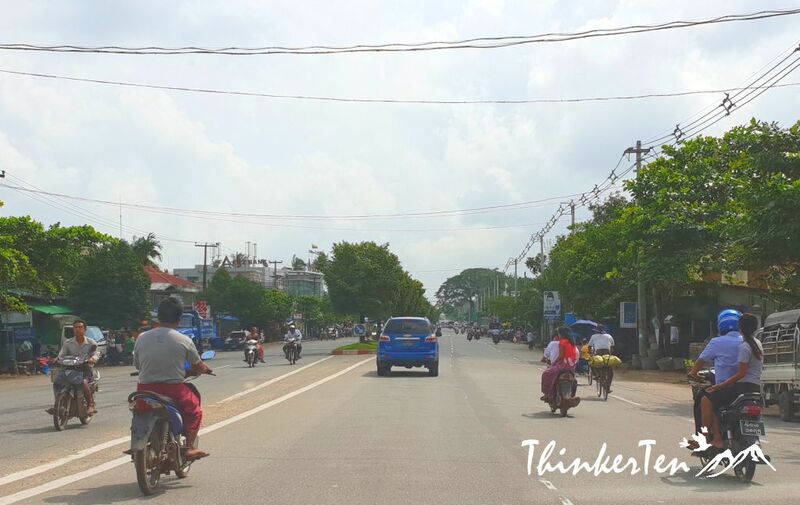 When we are in the outskirt of Yangon, we do see plenty of motorbikes. 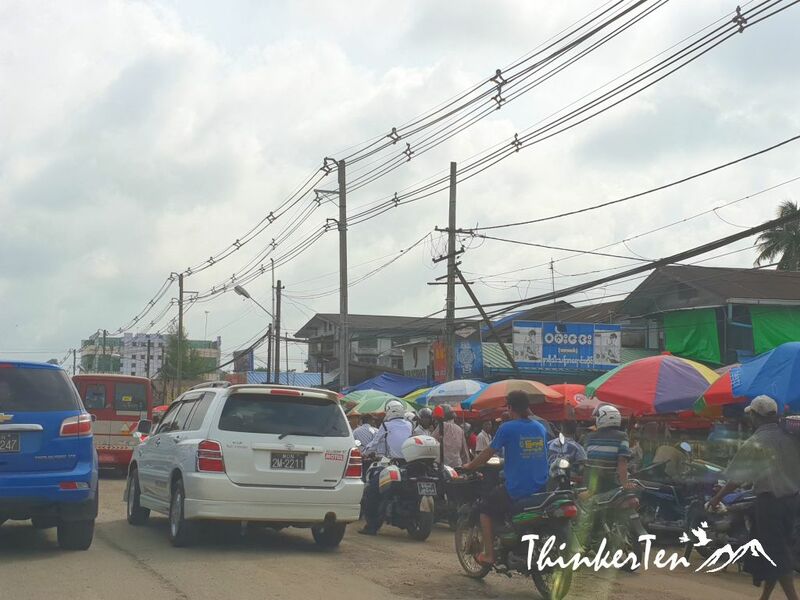 It was a Saturday morning when we passed by a small town on the way to Bago. Many locals were out in the early morning doing their groceries shopping, the roads get so pack with people, cars, bicycles, motorbikes & trishaw. 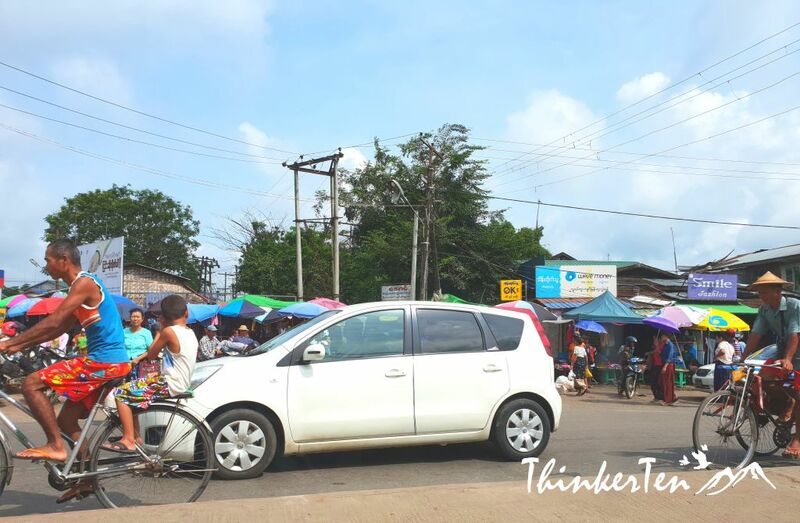 Pick up cars are widely used all over in Myanmar, mostly by the local. It usually cramped to the top with all sorts of stuff and you may have to stand at the edge. The skirt is called longyi (sarong), widely seen in Myanmar. Men and women wearing longyi but they are not unisex attire. Men longyi usually are stripes or checks with plain dark colors. Women longyi are more colorful and bright. Men and women longyi wear in different ways of tucking them together. Who said you can’t work with skirt? These men seem has no problem with that. 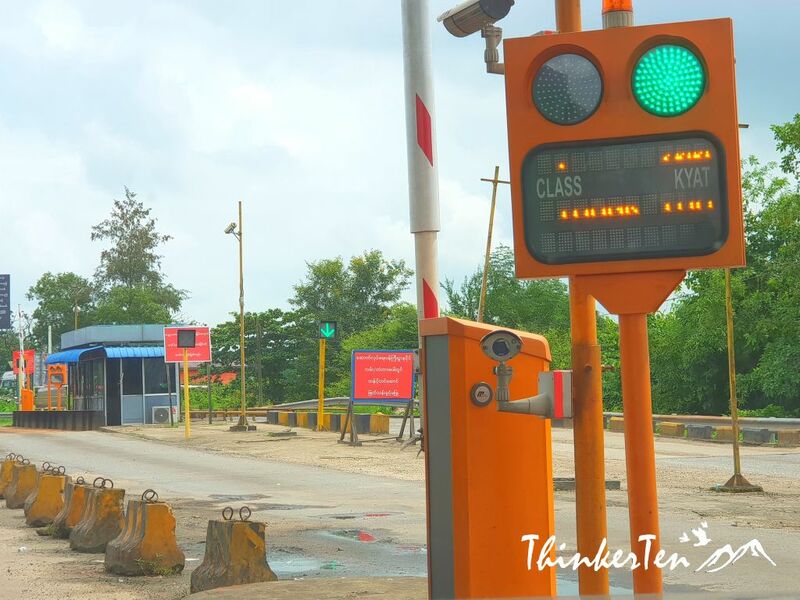 This is a manual toll gate, pay and get your receipts. 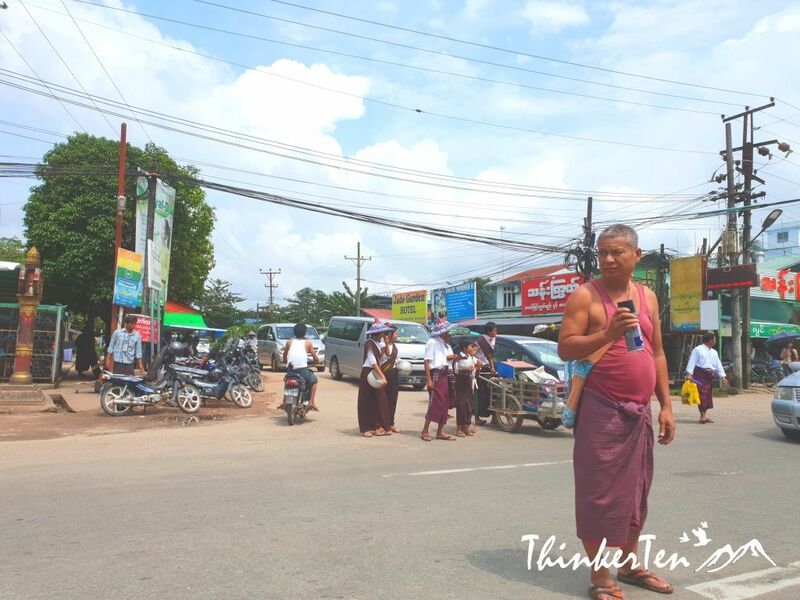 Myanmar people are familiar with crossing the road, they seem to be carefree and walk fearlessly through the road. This is what you do, cross from one side to the order and stand in the middle of one street, (like the below picture). Sometimes it takes 5 to 10 mins to cross the streets because no drivers stop or give way to you. 7. Buddhism are the majority here but you do spot a Mosque! 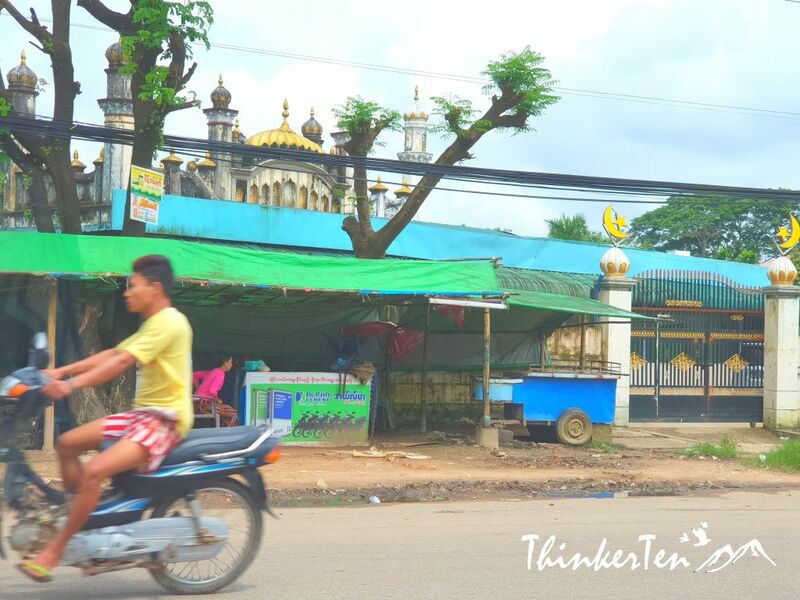 Over 90% are Buddhist but you also see other religion sites on the road trip – A mosque : There only 4% of the population of Myanmar are Muslim. Hinduism in Myanmar are even lesser, only 0.5 % of population are Hindu and most of them are Indian Myanmar. And Bago state consist the most Hindus in Myanmar. 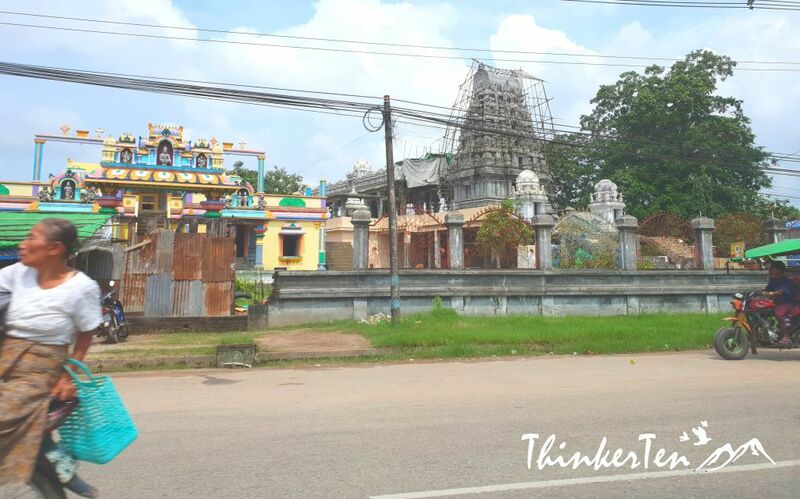 Glad to have spotted a Hindu temple on the road trip to Bago. Burmese use the baskets to carry their daily shopping and fresh fish. Some are in straws and some are in plastic. 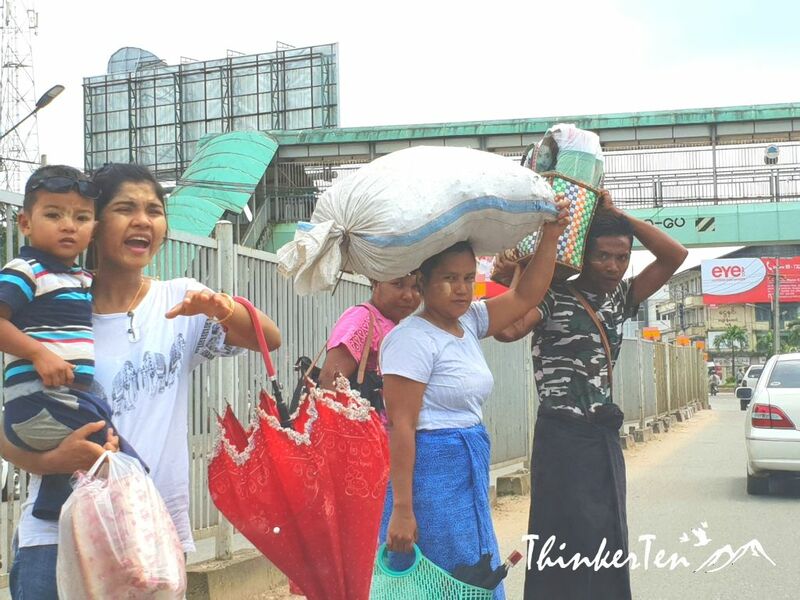 Men and women love using umbrella in Myanmar because of the frequent rain. Morning is usually sunny but it usually rains in the afternoon. Women’s umbrella is more fancy and some even matching with their outfit. If you don’t know what to get in Myanmar for souvenirs to bring home, go get the “Pathein umbrellas”, available in different colors, made of paper & hand painted. 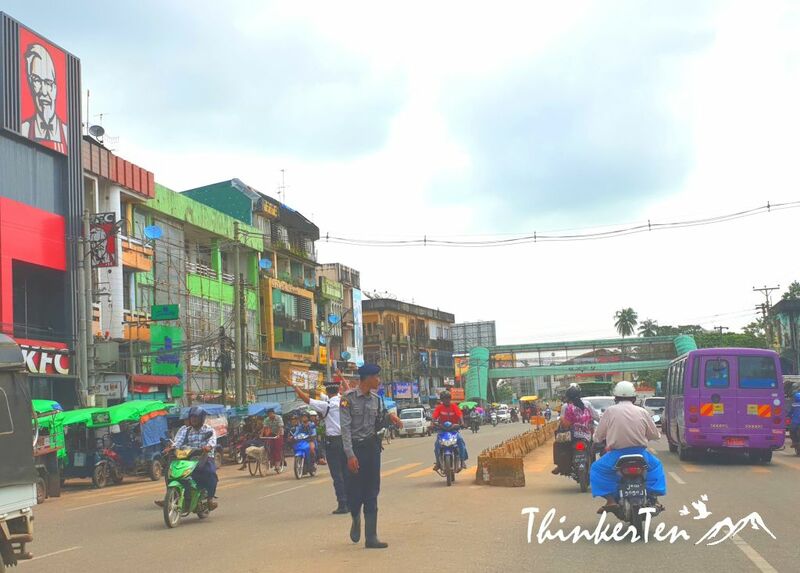 Pathein is a small town west of Yangon. 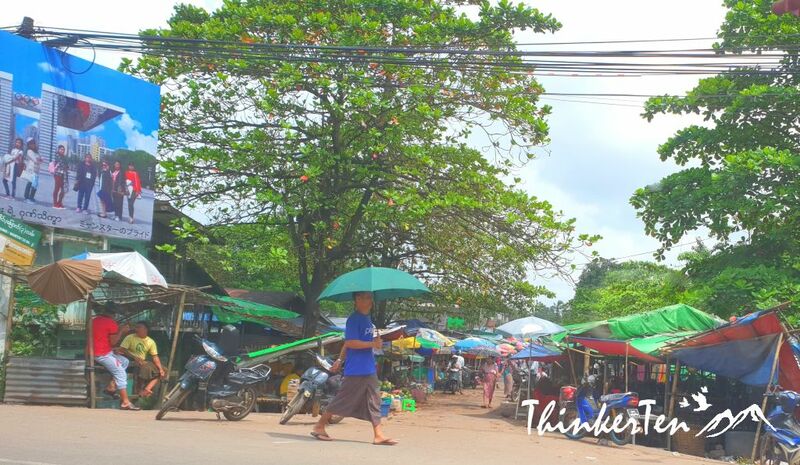 Pathein umbrella can be found in Scott market in Yangon. 11. Motorbikes with more than 2 passengers are common. 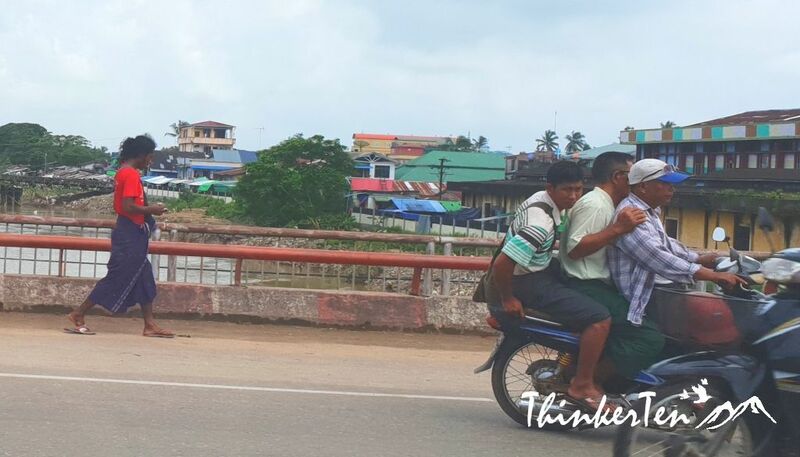 Motorbikes with more than 2 passengers is common sights. Some can fit the whole family, father, mother, and few children in a motorbikes. Most don’t even wear helmets. Many are not owning a car yet so the only way to transport a huge pack of stuff is using motorbike. My favorite KFC is available in the small township to Bago. 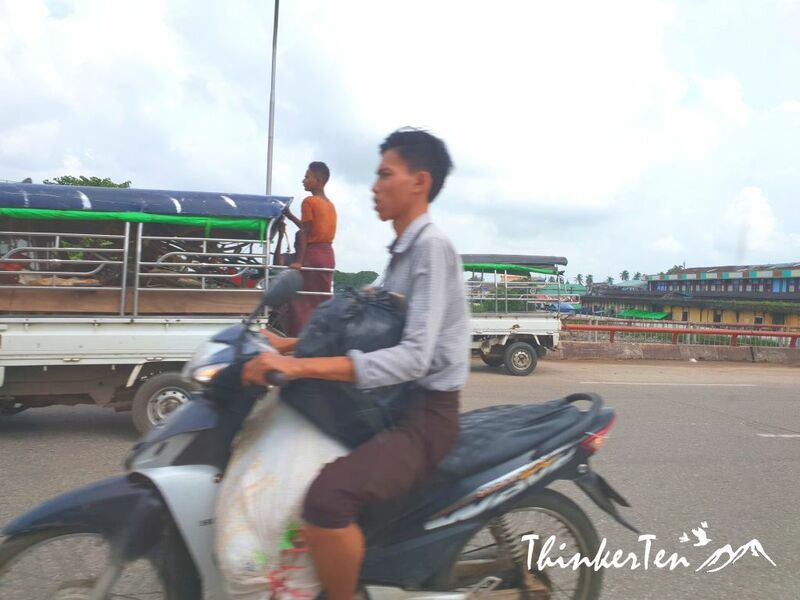 One of th magical sights seen in Myanmar is vendors with giant stacks of goods which were balance on their heads. Most people don’t even need a hand to steady their loads. They can squat, sit and walk with the big plates of stuff on their head. Bago is an ancient town 76 km away from Yangon. 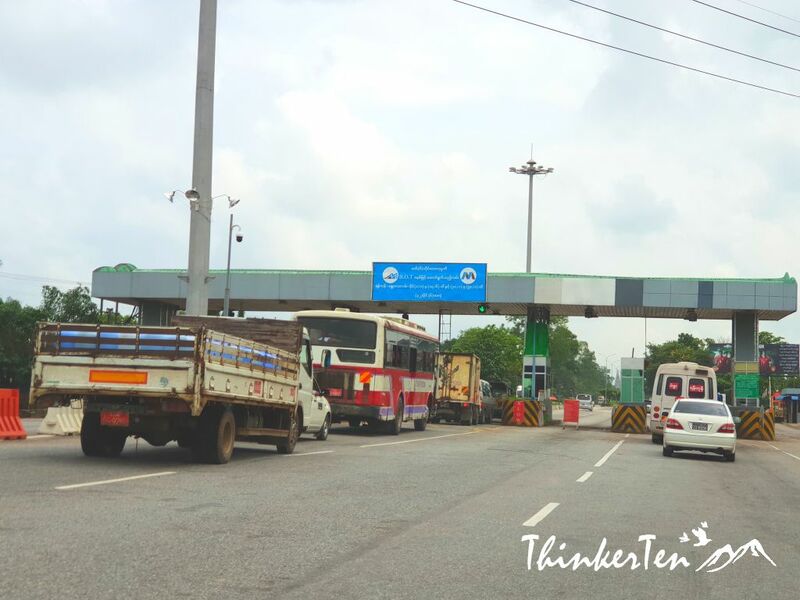 The road trip takes about 2 hours and you will experience plenty of interesting site along the way. Bago has several historical sites to visit which can be done within a day. Staying over in Bago is not necessary. I love the pick up cars – what an interesting idea. And the male skirts are so awesome – it makes sense and I love the idea. The photo opportunities in this setting are incredible. Thanks for your comment. The skirts for men is called ‘longyi’. Men and women wear longyi but different way of tying the knots. It is interesting to see men wearing longyi to office too. This was so interesting! 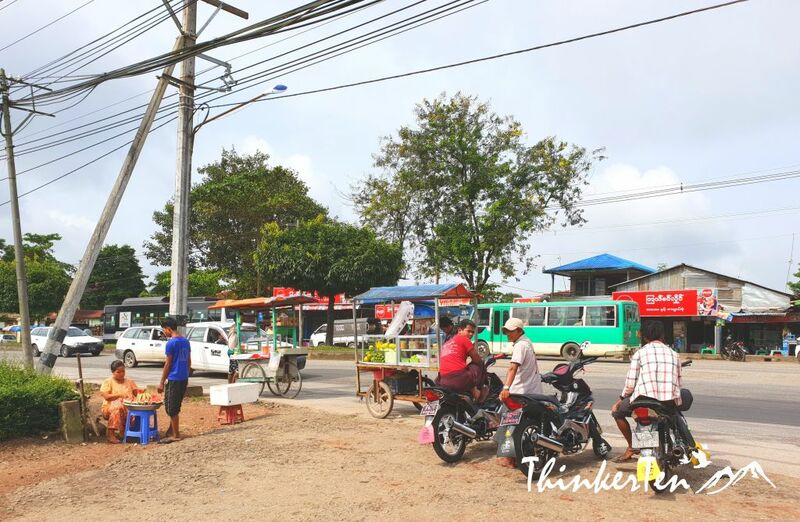 From the motorbikes to the morning markets, Bago sounds like a neat place to visit! What a cool trip! Though, I will say it was a bit of a shock to see something as modern as a KFC in such a rural location. And what an interesting story about the banning of the motorbikes! Luckily the banning of motorbikes only in Yangon city so when I was in the ourskirt, I started to observe motorbikes running around and can be quite messy. What neat sites to visit! Love all the markets! That would be such an adventure! I love seeing them hustle to get that limb out of the way. I would love to see their morning markets. They must be pretty neat! The morning market is pack with people and interesting to see how they carry their groceries. They usually balance the things on their head and carry a re-useable plastic/straw backet on their hand. This is so interesting! I think the motorbikes would stress me out as a driver, lol! People seem to be really careless at streets. In some of the photos, riders don’t even wear helmets. And the streets are crowded. 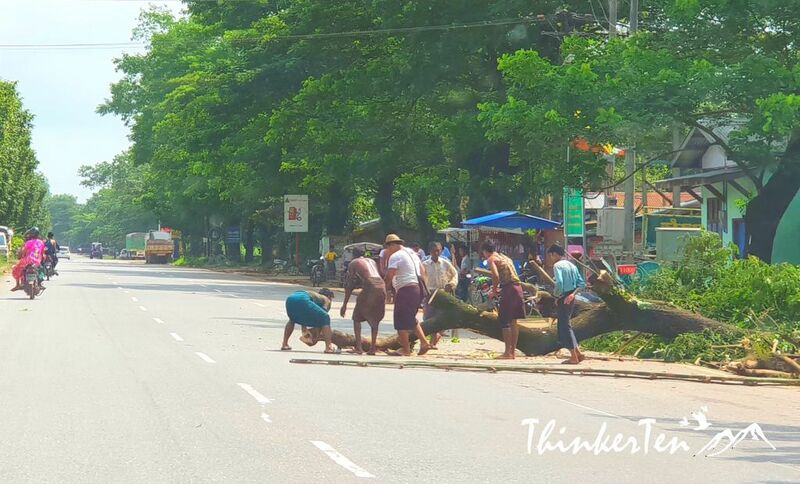 You are right, it seems people in Myanmar do not have the safety awareness. I think government has to educate their people in the road safety. Seems like picking-up cars is very similar here in Manila, even in the most urbanized area. I would love to try out the picking up cars one day in Manila. Been to Cebu but not yet to Manila. Hope to visit soon. These pictures remind me of my native county, the Philippines. I miss home. Philippines is a beautiful country and I have been to Cebu many years ago. People are friendly and always smiling, that’s my impression of Philippines. This would be such a great experience. I have always wanted to have a cultural experience like this one.